Ruth was quite a lady. A family had moved to her town from Israel. She had met and married one of their sons. In less than ten years she had become a widow. In that time she had seen something different about this family. Their customs were different, their religion was different, their hopes and dreams were different. Even though they lived in Moab, they didn't quite fit in. Yet in all of that there was something that attracted her to them, especially Naomi. Maybe when Naomi's husband died she saw the strength that would sustain her when her own husband would die. Whatever it was, Ruth developed a strong loyalty to Naomi and the family she had married into. She became totally committed. Ruth's sister-in-law, Orpah, also had a strong attachment to Naomi. She, also, had seen and felt the things Ruth had - including the loss of her husband. But while her attraction was real and strong, it was founded on self-interest. Even through it was emotionally heart-rending, she would cut her ties with Naomi and float back into her routine, her family, her gods. It was comfortable. It was familiar. She would be provided for until she married again. So Orpah fades from the pages of history. Undoubtedly a good young lady from a natural viewpoint, but unwilling to rise above her own concerns. Ruth's loyalty, on the hand, was one of total commitment. Her focus was on her relationship with Naomi. She loved beyond herself. She would change her culture. She would change her nation. She would abandon her gods and embrace the God of Israel. She would not be deterred. She would be loyal until death. She had a holy stubbornness. As such, Ruth is a picture of Christ. The loyalty of Jesus to the Father was total…and would take Him to the cross. He never sought anything for Himself. His concern was the honour and glory of the Father. Jesus never even did anything independently. His loyalty and obedience was complete. What about us? How loyal are we? 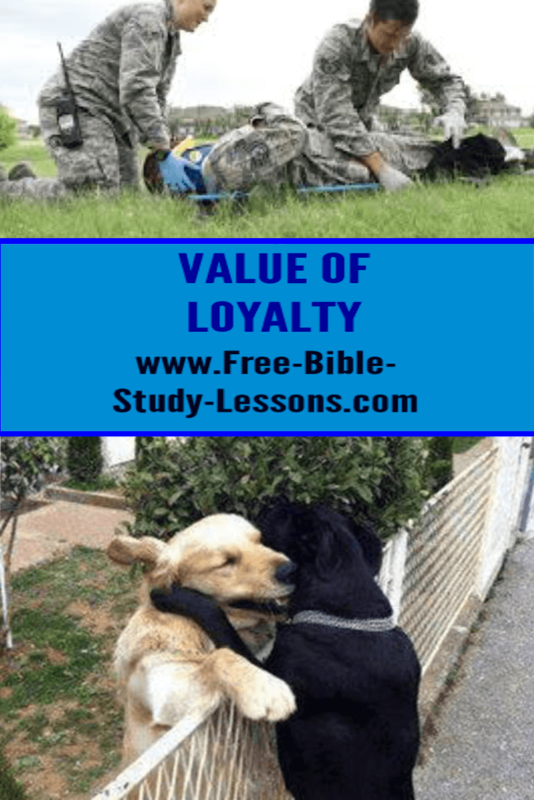 Do we have a stubborn loyalty to Jesus Christ and the Word of God? Or is Christianity basically a self-help program to be abandoned if it doesn't live up to our expectations? Are we willing to compromise the Word of God with evolution, gay marriage and other social issues which make it unpopular in the eyes of the world? Are we willing to bear shame and rejection to maintain our loyalty or will we turn back and fade into the world's system? How about our local church? How loyal are we? Do we criticize and complain or are we loyal? Do we jump to a new church every time we get upset and do we stay where God planted us? Do we support it faithfully with our finances? God values loyalty to Himself and His Word. While many in the world may sneer at the concept [unless they can manipulate it for their own benefit], the mature Christian remains loyal. He or she does not understand everything about God or what is written in the Word of God…no one even comes close to that! At times life may be confusing or hurtful, but like Ruth loyally clinging to Naomi, they cling to the Lord Jesus Christ. Nothing, not even death, will shake them.